Pitru Paksh Shraddh, Tarpanam, Vavu Bali, Pinda Danam, Bali Tharpanam or Shraddham are the various names used to describe the rituals performed for the dead parents, relatives and ancestors in Hinduism. Shradh holds an important place in rituals associated with Hindu religion and it is performed without fail by most Hindus. Apart from the immediate rituals after a death, there are also annual rituals like Pitru Paksh Shradh in North India west and East India, Aadi Amavasai in Tamil Nadu, Karikadaka Vavu Bali in Kerala, Basant Panchami in Eastern parts of India and Amavasya rituals in other places. Upanishads and Bhagavad Gita talks about the journey of the dead and about the importance of the rituals dedicated to them. Annual Shraddh is usually performed during the Dakshinayana period (July to December). Prashna Upanishad indicates that the rituals performed on the first Krishna Paksha Amavasya during Dakshinayana period directly reach the Dead. In South India, the first Amavasi after Dakshinayana is considered highly favorable for performing the Shraddham. Shraddh should be performed with a pious mind. The person who performs the Shraddh should realize that for his birth, body, knowledge, wealth and sanskar he/she is indebted to the ancestors. All that is there was given by the ancestors. So the rituals performed is accepting this fact and is sort of thanksgiving. Both male and female relatives of the dead can perform the rituals. The rituals including the ‘pind dhan’ that are performed reach the dead ancestors through the rays of Surya (Sun.) It is said that a year of humans is a day for the dead and therefore the ancestors enjoy the fruits of the annual Shraddh throughout the year. Another belief is that the souls of dead remain in peace in Pitru Loka as a result of the rituals performed by their children or relatives. It is also said that the dead bless them for this and it helps the children and relatives to lead a good life on earth. Equally important is feeding the poor on the day. Whenever rituals dedicated to the dead are performed, people distribute food and clothes among the poor. Usually the rituals are performed on a riverbank or on seashore. There are also temples in India where the rituals can be performed like the famous Vishnupad Temple in Gaya, Bihar. In some places crows are invited to feed on the rice cake that is prepared for the ritual. The method of performing the rituals slightly varies from region to region. But the essence of the ritual is the same. It is the duty of all Hindus to perform Shradh for their dead ancestors. Origin of Pindadaan, or worship of Pinda, which is part of Shradh rituals is found in the Shantiparva of Mahabharat. The Varaha incarnation of Lord Vishnu introduced the concept of Pinda to the world. Pinda means a rice bowl. Legend has it that he created three Pindas from his molar tooth and placed it on darbha grass facing south direction. The three pindas are representatives of father, grandfather and great grandfather. He then performed ritualistic worship of Pindas with sesame or til seeds. The worship of Pinda for deceased ancestors began under the guidance of Varaha. Pindadaan is mentioned in the Yajurveda and Gruhya Sutra. Tilodaka in Shradh rituals is water mixed with Til or sesame or ellu. The water containing sesame seeds is charged with mantras and is of special significance in the Shradh ritual. It is believed that the water charged with sesame helps in attracting the attention of ancestors in the pitru world. An energy whirlpool is created inside the vessel and the pitrus are attracted to it. This helps the pitrus to enter the earth world quickly. In Shradh ceremony, panchabuthas which form the body is also represented through Til. Darbha, also known as Kusa or Darbhai or Durva, is of great importance is Shradh rituals dedicated to ancestors. It plays an important role in all death related rituals in Hinduism because it generates positive radiance. When darbha is used, the positive radiance emitted from it helps sattvic particles to prosper and it also negates the rajasvic and tamasic particles. The deceased soul is thus able to absorb only sattvic energy. As Darbha creates a positive atmosphere, the shradh ritual becomes effective in lesser time. If any component is missing during Shradh ritual, it can be filled by placing the grass with root. The darbha for Shradh ritual should be plucked from clean ground. Darbha for shradh should be plucked along with the root. Darbha with root helps pitrus in attaining victory in Pitruloka. Akshat or Akshata is the unbroken rice used in Shradh and Tarpan Rituals dedicated to dead ancestors in Hinduism. Akshat is widely used in numerous other Hindu ceremonies. 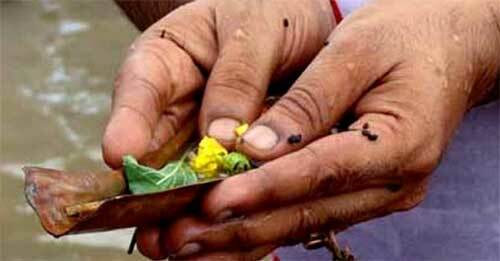 In Shradh ritual, it is used by the priest to bless the person or group that conducted the Shradh rituals. The priest blesses the hosts by sprinkling unbroken rice. Only unbroken rice or barley is used for the purpose.